When my brother Robert quotes this in a meeting, he always makes it a point to say the word “period”. “I am responsible for my own serenity PERIOD.” This reminds me that if I’m not serene, I can change it anytime I’m ready to step up and take those actions that bring the feeling of serenity into my life. 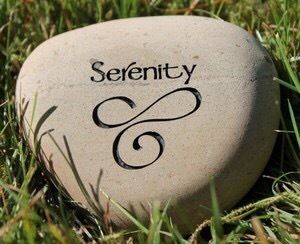 Often this means first detaching from the person, place, situation or steam of thoughts that are taking my serenity away. Then, because the program is so rich in solutions, I have an endless supply of options available to me to being back my serenity. And once I’m feeling happy, joyous and serene again, as if by magic, my problems don’t seem so overwhelming anymore and… ILML!